This climate analysis was conducted as part of the DFID-funded Economics of Climate Change in Rwanda project and part of a wider study in East Africa. Rwanda's climate is dominated by the Inter-Tropical Convergence Zone (ITCZ), which passes over the country twice a year and determines two rainy periods: from mid-September to mid-December and from March to May. The ITCZ is in its turn controlled by the position and intensity of subtropical anticyclones. The equatorial climate is further modified by a widely varying altitude across the country (900 m in south-west, 1500 to 2000 m in the south and the centre of the country, 1800 to 3000 m in the highlands of the north and the west and 3000 to 4507 m in the regions of Congo-Nile Crest and the chain of volcanoes) and by the presence of large water bodies in the region. The analysis of rainfall reported in Rwanda's National Adaptation Plan of Action (NAPA) shows that the period between 1991 and 2000 has been the driest since 1961. In fact, Kigali weather station was marked by rainfall deficit during the years of 1992, 1993, 1996, 1999 and 2000 out of which two were very remarkable (1992 and 2000). There were two years with notable excesses of rainfall (1998, 2001). Similar excess was observed in 1979. Floods, landslides, and drought episodes constitute the major repetitive natural disasters for Rwanda and are often linked with ENSO episodes. Rwanda suffered serious floods linked to the El Nino episode of 1997/98 which destroyed a large number of agricultural plantations and ecosystems occupying shallows and swamps of Nyabarongo and Akanyaru river basins. 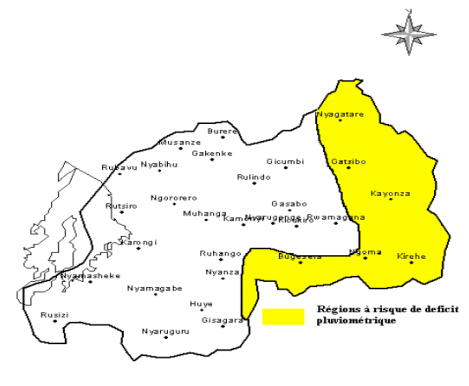 Prolonged drought of 1999 to 2000 seriously affected Bugesera, Umutara and Mayaga regions which was equivalent to the famous Ruzagayura famine during 1943 to 1945. Landslides are common in the North (Gakenke, Cyeru, Rulindo, Butaro, and Kinihira) and the West (Nyamasheke, Karongi and Ngororero) of the country, with a notable occurrence in 2001/2002. Results presented here are produced using CSAG’s Climate Change Explorer tool – these are empirically downscaled scenarios produced through a statistical technique to produce station level projections of climate change from global climate models (Hewitson and Crane, 2006). The A2 emissions scenario is used for this projections. Unfortunately Kigali is the only site in Rwanda where data is available. Average maximum monthly temperatures are expected to increase by 1.5 - 2.7 deg C for 2046-2065, and greatest warming is likely from July-Sep. For monthly minimum temperatures may rise by between 1.7 and 3.1 deg C for 2046-2065 from results from a set of 9 GCMs, with the most warming occurring in June to August. In some months there may be an increase of 2 more days per month with temperatures above the 90th percentile (i.e. an increase in the number of extreme hot days). The models are remarkably consistent in projecting increases in precipitation for Kigali (i.e. we have high confidence in the direction of change). Three out of nine models indicate possible decrease in precipitation in March and two in April, August and October. There is strong model agreement from September to December, indicating a strengthening of the second rains, and also in April and May which points to a stronger peak and end to the first rainy season. However, confidence in the magnitude of the change is low. What we can say from the models is that it is unlikely to get drier in Kigali. There is also an indication from looking at the monthly rain days with rainfall higher than the 90 percentile (i.e. days with extremely heavy rainfall) that such extremes are more common in a lot of the scenarios with most consistency in December and January and May to July.